People have always used clothes and accessories to express their personal style, and recently more and more companies are offering customers the opportunity to create truly unique looks, by enabling them to customize the design of their products. Earlier this month we reported on Romanian bike brand Pegas, who were inviting customers to create a unique bike by sampling colors from their urban surroundings. 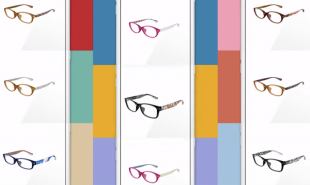 Now, Japanese eyewear company JINS have created the JINS Paint app, which lets customers alter their frames, adding colors, patterns, stamps, photos or even messages to their new glasses. To begin, customers simply download the smartphone app and choose one of seven basic frames. They can then customize the inner and outer surface, adding images, patterns and readymade stamps to their heart’s desire. Once completed, the user can review their creation via a 3D rotating simulation and add it to a gallery of frames which other users can browse. They can order their design online by adding it to their cart. The custom frames cost ¥7,900 — about USD 66 — and shipping is free within Japan. JINS are famous for their innovative glasses — we recently wrote about their JINS Meme frames which detect drowsiness in the wearer. How else could spectacles be adjusted to enable customers to make them their own?